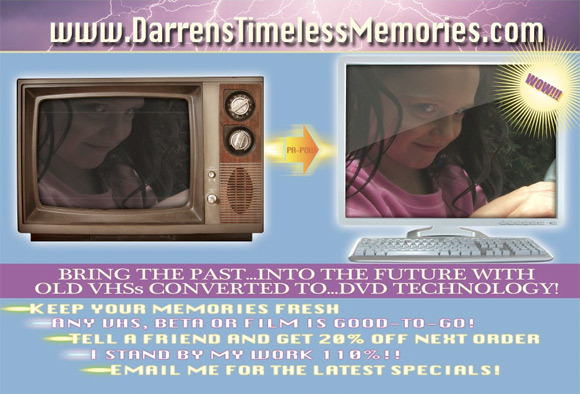 Darren's Timeless Memories - Viral Website for 'Paranormal Activity'? Bring the Past… Into the Future. Last week the first official trailer for Paramount's Paranormal Activity 3 hit the web (watch here), introducing us to younger versions of the two sisters seen in the previous films. Around the same time that teaser trailer first hit, I started noticing cheesy printed flyers popping up around Comic-Con for Darren's Timeless Memories, a VHS-to-DVD conversion company run by some cheesy dude in sunglasses named Darren. It all seemed to make sense - VHS conversion, earlier footage - this has to be a Paranormal Activity 3 viral of some sorts. And if you visit the site, that definitely seems to be the case. There's not too much to do on Darren's website, DarrensTimelessMemories.com, but if you're a fan of the Paranormal Activity franchise and want to look for clues about this new sequel, you should probably look around anyway. He has a few "Client Examples" with other videos that seem unsettling but don't have much scary content. And he lists his email all over, which seems like the next step for those curious to get even deeper into this viral. The only other creepy part of this is the eyes on the girl in the photos on the back of the flyer - see it here. Otherwise, we'll watch this site to see if anything changes, and keep an eye on Paranormal Activity anyway. Hopefully this turns into something more, in the meantime watch the teaser. Well, its definitely, definitely connected. It has a video titled "Featherston Family Tape 6", which is a very short scene but it's right from the trailer for the new "Paranormal Activity;its the little girl with the creepy eyes on the flyer and the same girl from the PA 3 trailer. That's little Katie Featherston....the actress' real name from the first "Paranormal Activity" is Katie Featherston and she played a girl named Katie. I'm sure some people will say "duh", but just thought I'd point it out. This is so bad, i don't get it, why would you use something like this to promote a movie?! A shot from an older tape pops up in the first video. Looks like some kind of ceremonie? An exorcism performance or something like that? All I can figure out is a man/woman in a white robe on the stage, with people in the front as an audience. O wait! It almost certainly has to be the baptism of Katie! Could fit into a possible demon-storyline.